The SNK 40th Anniversary Collection on Nintendo Switch is shaping up to be a retro blast including more than 13 classic titles from the Japanese veteran's library of work. As the November release for both Europe and North America draws closer, new information about the compilation is slowly being revealed. As previously noted in our E3 2018 hands-on, the collection includes a rewind function and certain games will be playable in both 'Home' and 'Arcade' form. 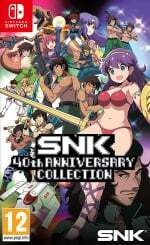 The SNK 40th Anniversary Collection arrives on November 13th in North America and on the 16th in Europe. Are you a fan of any of the above-mentioned games? Do you like the idea of this game including downloadable content? Tell us below. Very cool! I don't know any of those extra games, but I will happily give them a try. I'm not really sure why an anniversary collection needs dlc. Of course I'm sure right after this someone will defend it as being necessary for them to profit. I assume it'll be like that on all consoles do. Oh well, I can't cry about the price of free and I doubt too many gigabytes of data on the switch will be consumed by games from the 80s. Too bad they chose not to include everything on the cartridge, but on the bright side, perhaps they will just keep adding old SNK games as DLC for years, like many hoped the NES and SNES mini would do. @Stocksy I'll be honest. I didn't see free. That makes it better but it's still odd to me that you have to have dlc like this. The emulation is probably the same for all the titles anyway. And it's not like they're demanding titles that haven't been done before. I'd much prefer if something like this shipped as a complete product instead of having dlc attached. @saintayu for sure. I’m all about everything on cart/disc. I’d already preordered this on strength of the 13 announced games so to know I’m getting extra stuff is welcome. What an awesome collection! Each game has a watchable play through that lets you join in and take over at any point. It's like YouTube but better lol! If I wasn't already sold, then Time Soldiers would have definitely been the one to seal the deal! Also, thanks for the info graphic. Helps clear up the ongoing confusion around the game list immensely. While I'd prefer everything to be on cartridge, I hope there's paid DLC on top of these 10. There's a lot more than five decent pre Neo Geo arcade games left in this library. Heck, there's 12 more arcade classics just from SNK's PSP Minis line that aren't even here so far (Sure to drop by a few when the last 5 games get announced), let alone games that weren't covered like Satan of Saturn. For those that bought the PSP Minis releases, Fantasy and Munch Mobile are both new here. SNK hasn't previously released emulated versions of those, unlike all the other announced arcade games so far. At least they're not paid DLC, but... really? Didn't they fit in the cartridge? 8 bit games? I want this collection so bad. Time Soldiers was actually a favorite arcade game of mine when I was a kid. Crystalis and P.O.W. make this collection worth it! That moment when you realize Nintendolife still hasn’t reported on the new Smash Demo at Best Buy. @Moroboshi876 Think its more to keep the sales going even after launch. For those that don't pick it up day one because its missing a game they wanted, only to hear news that game's being added as DLC will then have more excuse to pick it up. Or just bumping up the number of games till it gets to a point where jolly come late-ys are like "Yeah, that's a much better number for my buck!". SEGA did something similar by adding VR to its Mega Drive/Genesis Collection on PS4 months after it came out which was also free. Without the proper nostalgia value, these obscure games are pretty much worthless to me. Other people might find excitement in this collection though. @Angelic_Lapras_King I understand what you say and it might be, but I like my physical games totally physical, and if part of them are in fact digital I feel a little ripped off. Even being free. Anyway I'm really excited about this collection. I love obscure classics and the fact they're pre-Neo Geo and not the SNK compilation of the usual games for the nth time. So yeah.... big time disappointment here. They've been promising over 40 games for this collection yet only 13 will be on cart and we have to wait who knows how long for the rest? Why release the thing before its finished yet? At least delay the cart until all games are included. This is pretty silly overall. @Moroboshi876 Thats true and it would be nice if everything was on a disc or cart, but even today only part of the game's data is actually on the disc for XBONE/PS4 games, the rest is downloaded from a server and even some Switch games have to have a hefty download to play. Hell, I've even heard of the odd game that has like 250MB of the game on disc while the rest of the GB is a download. Its concerning what will happen to this current gen after the servers are taken down. Will our discs be worthless? While I'm sure Microsoft would keep on supporting backwards compatibility as long as it can, it being a big selling point for XBONE over PS4, though it has its limits only supporting a portion of the libraries, and I'm not sure the same can be said about Sony or Nintendo who'd rather you'd rebuy old games than play your old copies on new systems. The best we can hope is that someone backs up those downloads needed to play discs so we can download off the Net and put onto our consoles, but then that opens up a new can of worms over who owns the downloads and takedowns, etc. Whoa! That is unexpected but totally awesome! So basically, we are getting some obscure DLC games that do not cut the mustard. These games are said to be "historical" in the 40 years SNK has made games, but come on. They could have made this way better. By giving us games with a timeline from past to present. They do not have to give us 40 games but this announcement is a total let down. I was waiting for those last 10 games to be announced and I am disappointed. We have Crystalis, and well we have Crystalis. @Angelic_Lapras_King I know, and I'm sure next generation will be digital only, and if now digital games are more expensive than physical ones (although it should be the other way around because with digital games distribution costs are lower) but people buy them anyway, the future will be made of digital games for 59,99 and the offers controlled by them, and no one will complain. But I hope when updates for games stop coming they won't need internet connection to be played (they don't now, updates are not the same that requiring permanent connection), otherwise I'll give up on video games. I don't want games that will work for just a few years. @Angelic_Lapras_King it did 🤔 I did not know that- heads to amazon. Guerrilla War? I'm guessing they're not including the Fidel Castro edition. The wording is still unclear. These 10 games are part of the "more than 13"? I hope they don't, which would mean that we'll have more unannounced games in the cart. @saintayu It's free. They just won't be ready upon release. This is a day one for me!! And 10 free classic games to be added? Why thank you very much! 😃😃 consider adding these extra games to the card?? So we have them for keeps!! I preordered this collection on the strength of Crystalis alone, so to me, everything else they add is gravy. I definitely wish it was all on-cart...but indeed, free is free. Here's hoping Baseball Stars for the NES is one of the five games. This comment section once again demonstrates how few people understand the business & marketing side of the gaming industry. @Gs69 Thr NES version is pretty ruthless, too and it runs really slow. But at least there’s a code to just revive on the spot. It’s pretty fun 2-player. @rushiosan Why not, you know, give them a chance? There’s more to SNK games than nostalgia. Maybe I just missed out on the arcade as I was way too young when all of these came to arcades so I'm not familiar with any of them really. So I don't think I'll be grabbing this one. Still having more games for Switch owners and SNK fans to choose from is a good thing. When I was younger I thought the game that Konami's The Jackal was SNK's P.O.W., but they are very different games and I prefer the Jackal. As far as DLC I would love to see 1991's King of Monsters, that was an awesome game in my opinion. Aside from that SNK has always been about Metal Slug and King of Fighters for me, both of which I would possibly grab this collection if they were included. Is Crystalis the NES version? Was there also a version on NeoGeo? @River3636 @SDF_Macross77 I don't remember them promising 40 games at all. And, from the time the preorder page went live, all the games announced were targeting SNK's "golden age", which basically means pre-NEOGEO games from the late 70's-1989. Anything after that time period was never suggested or implied, as far as I know. @Antraxx777 I remember it being mentioned in a magazine in the late 90's (GAMEFAN, possibly EDGE, it's been so long) about a Crystalis game being in the works for the NEOGEO, but nothing ever came from it. @masterLEON I think I confused 40th anniversary with 40 games in my mind over time, lol. I knew Neo Geo wasn't in this collection and I am glad for that. Guess my complaint about game count is nullified but I'm still disappointed they won't all be on cart. Only reason I am getting it. Wait so only 13 games will be on the cartridge with the other 10 as digital download? Why SNK do you have to be like Crapcom now? The only reason I was interested in this is because all the games will be on the cartridge, now I'm not sure if I'm interested anymore, on the other hand good job making the 10 extra games as free DLCs and not a download code. Pretty much the only positive about this. Crystalis... P.O.W... Ikari Warriors... Athena-- One game, one system, one place. What fresh nirvana is this I am in? @masterLEON I never said I wanted 40 games, I just wanted some legit games to go with the originals that were announced. I watch the Pax video and I was not impressed. @River3636 Sorry, that was SDF_Macross77 that wanted 40 games. But yeah, it'd be nice if we had some later releases, even though those are far and in between. And also that's a really short list. KoF Sky Stage, Trouble Witches NEO!, Koudelka, King of Fighters: Kyo and Athena games for the Playstation, NEOGEO Battle Coliseum, KoF XIII (I wish), and literally a handful of others. We know they won't do the NEOGEO games, or probably are not contractually allowed to because HAMSTER's doing those, most likely. How about the Hyper NEOGEO, Atomiswave, and Taito X system? Digital Leisure is good at 2D emulation and classic systems. I just don't see them handling anything newer than late 90's hardware. And even if they did, it'd probably miss the 40th Anniversary time frame due to their complexity (that, and knowing Digital Leisure, they'd probably want to rebuild those games from the ground up rather than port a port). GB, GBA, DS, and Neo Geo Pocket games, maybe. But who knows how much time they really had to do this project? They're not a big company. The safe bet was sticking to the oldies. Thanks for the vid, though. I'm actually really impressed at what they pulled off with this collection. Forcing the rotating joystick games to recognize twin-stick inputs, the complete pre-NEOGEO timeline museum (and accurate, according to 6:59 in the video), not taking the low road with existing ROM dumps and working only with original hardware, even fixing game-breaking bugs along the way (Sasuke vs. Commander, 13:20). For me, this'll be well worth the price for the Collector's Edition. But maybe there aren't 40 SNK games pre Neo Geo. I'll be happy if apart from these 10 downloadable games the cart really comes with more than 13 games. Maybe they're counting console versions and arcade versions as different games though. Fun fact: Fantasy is the first video game ever to include the continue feature. It's historically interesting in itself. That changed the way they design video games, with the possibility of longer stories. No small feat(ure). EDIT: OMG, there are actually and exactly 42 SNK games before the Neo Geo that made the arcades, so they could include 40 in this collection if they wanted. That is not counting games made directly for domestic systems. I will get this for Crystalis alone. So, basically the PSP's SNK Arcade Classics 0 collection. Which never made it out of Japan, sold about three copies and is now impossible to find. As an old, I love these games. I can still hear the music Vanguard plays when you get the energy shield. But I'm skeptical if they kids today will go for these. Lets hope I'm wrong. @Antraxx777 never tried the NES version used to play this on the c64 and Amiga plus the local chippy had the arcade machine spent an absolute fortune but never completed it it was tough !